On Tuesday, June 9, Melanie and I spent an enjoyable, albeit very busy, day in Beantown, at the Boston Convention & Exhibition Center. This was the fifth time in the history of the International Microwave Symposium (IMS) that Boston hosted the event. Being a big fan of M*A*S*H, I cannot think of Boston without also thinking of Major Charles Emerson Winchester, III. IMS 2009 was a huge success from the standpoint of RF Cafe. My purpose was to spend a full day making contacts with as many of my advertisers as possible. Perhaps unbelievably, I have only ever met a handful of the many advertisers who have invested their promotional budgets in RF Cafe. They are the people that help to deliver the vast resources of RF Cafe to you, and who, for the last two years, have provided for my full-time income. Fortunately, my objective of meeting everyone was achieved, and I got many good photos of the exhibit hall displays (see below). According to the Microwave Journal website, "Based on initial registration data for IMS2009 that took place June 7-12 in Boston, technical registration was 2,676, an 11% increase over 2008 registration and exhibit-only registration numbers indicate 2,131 participants, an 83% increase over 2008. IMS2009 attracted 559 exhibiting companies, also an 11% increase over the number of exhibitors in 2008. According to preliminary results, the total number of IMS2009 participants, including exhibitor booth staff and guests, was 9,316 attendees, an 11% increase over 2008 participation. " So, it appears to have been a huge success for the IEEE and MWJ as well. "Bravo," as the early New Englander's might have said! This was my first time in Boston in about 25 years. I do not recall enough about what the city used to look like to determine whether it has changed much in that time; I assume that it has. My first impression while driving around Framingham and the outskirts of Boston the afternoon and evening before was that if there was a recession going on, it was not evident. The mall parking lots were packed with cars, and the one mall we visited was chock full of people, with every store space occupied. Rarely was a For Sale sign seen on the front lawn of any house, and 4 Sale by Owner signs were not taped on the back windows of all the cars. Boston's vital signs seemed normal. Gary Breed & Kirt B. As with most of the well-preserved New England areas, there is an amazing abundance of Early American architecture to behold. The old fire houses, municipal buildings, stone walled bridges, and ornate row houses were everywhere. Surely, I was a hazard to nearby motorists and pedestrians alike as I strained my neck to take in all the sights. On the way to the Convention & Exhibition Center Tuesday morning, we chose to take a route through the city rather than circumnavigate the sights by using the throughway. While sitting at a stoplight, I looked up and saw an array of cabling strung overhead that had separators every few feet to keep the spacing constant, even as the cabling turned a corner. At first I thought it was just old electric service wires still awaiting a budget for burying beneath the streets. Then it occurred to me that they were trolley car power cables. I looked down and saw tracks buried in the pavement. Moments later, darned if a trolley didn't appear at the corner of the intersection. It shares a lane with auto traffic. Very cool. I have to say that one of the most obvious presences in Boston is Dunkin Donuts stores. There are more Dunkin Donuts stores than there are McDonalds - literally. I love DD coffee and donuts, so I found myself thinking that if I was ever forced to live in Boston, it would bearable if for no other reason than the abundance of Dunkin Donuts stores. Come to find out, Dunkin Donuts was born in Quincy, MA, just south of Boston. A cool nerd sighting was the huge MathWorks complex in Framingham, close to our motel - I bet they eat lots of donuts in meetings there. Parking at the convention center was a fairly reasonable $10, and included a shuttle ride from the parking lot (we elected to walk). What was not reasonable was the $41 in tolls paid along the NY/MA Throughway system (each direction). Most of the exhibitors that I talked to remarked that while there was a lot of foot traffic past the booths, a large portion of the actual conversation was from window shoppers and sales reps looking to pick up lines to add to their repertoire. Design engineers looking for information on components for their projects were in the minority. Of course, most of them were probably at the show primarily to attend workshops and build networking contacts. Some people just roam around picking up all the promotional gifts that were being given away - Fresnel lens magnifiers, miniature screwdriver sets, pans, USB memory sticks, and mouse pads, and other nifty freebies. OK, I'll admit, those are items I picked up, but there was a lot more in the way of other cool stuff. A big difference between today's shows and those of the 1970s and 1980s is that back then you needed a large pouch or tote bag to haul home all of the printed databooks that you would pick up - they were worth their weight in gold and seemed about as dense as gold. Today, you get a CD or DVD to put in your folder, or better yet, simply a product flyer with a web address on it. No more hemorrhoids from databooks! Exhibit Hall A was teaming with activity by the time Melanie and I arrived at around 10:30 am. We came in on the back side of the building, so we had to cross the overhead catwalk to get to the registration area. It provided a good vantage point to see what was happening. MegaPhase graciously provided free visitor tickets for Melanie and me. 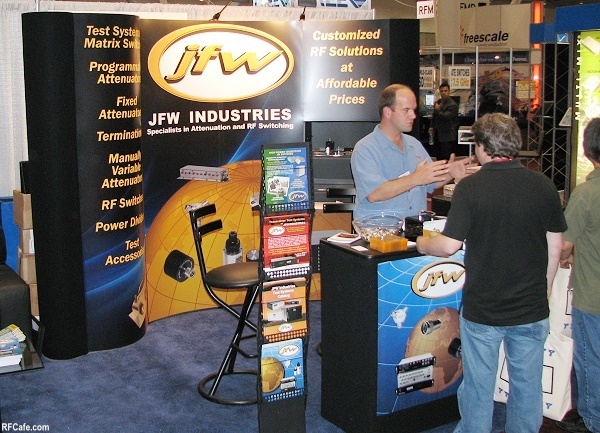 Prior to the show, I used the information posted on the IMS2009.org website to determine which of my advertisers would have display booths set up. I also sent out e-mails announcing my intention to see them there on Tuesday, June 9. Once we entered the exhibit floor, the first thing Melanie and I did was use our list of advertisers to mark the locations of all their booths. Navigation was made easy by overhead numerical signs and numbers on the floor. It was obvious that the event organizers knew how to run a show of this magnitude. Exhibit booths ranged in sophistication from fairly simple backboards with some products displays and literature, to elaborate setups that even included private customer meeting rooms. All the displays I saw were very professionally done, regardless of size. Those displays are not cheap, with even the simpler ones costing $1,000 or more. Larges ones like RFMD had must have cost many tens of thousands of dollars. Big, friendly smiles were on the faces of all the booth staff ... and not only when the knew someone was watching. I have to say that, at least in my last job where I worked in fairly close proximity with the sales folks, that is generally their disposition most of the time. A few days after returning from the show, I published photos from the Historical Booth area. If you are at all one who recognizes and appreciates the genius and hard work of those who came before us to lay the groundwork for today's RF technologies, then hopefully someday you will have the opportunity to witness the display that was provided at this year's IMS show. It is an awe-inspiring collection of some of the most important accomplishments in the realm of those us who work in the microwave industry. We have arrived, to quote Isaac Newton, "by standing on the shoulders of Giants." I made a point of getting to meet Gary Breed, of High Frequency Electronics magazine. I have been a fan of his common sense articles on RF / microwave topics for a long time. Gary was editor of RF Design back in the late 1980s when I had just graduated from the University of Vermont with my BSEE. In the early 1990s, at a time when DOS was still fairly common OS on PCs and lots of people were writing specialty programs, RF Design ran a software contest in which I ended up placing somewhere in the top entries with my Spur Finder program. It got me a cool T-shirt, and a few experimenter kits of surface mount inductor and capacitors. 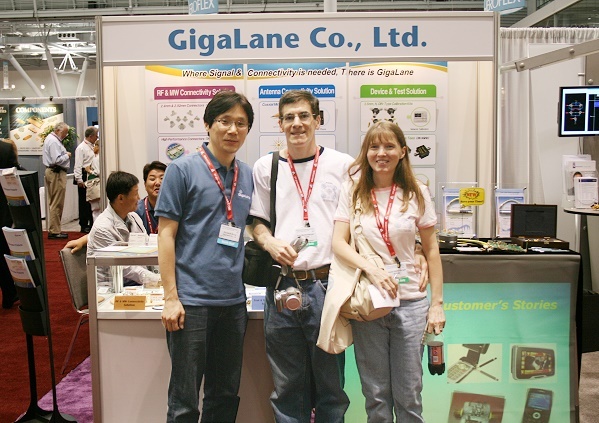 The recognition was a major motivator for me to continue writing software, and that led to RF Workbench (originally TxRx Designer), and then other marketable products. So, thanks to Gary for that! Alan Conrad, of Microwave & RF magazine, later did me a big favor by writing an article on the TxRx Designer software, but I did not get to meet him. All of the major RF / microwave engineering magazines will be publishing their detailed versions of the IMS 2009 show within the next month or so, including features like technical presentations and awards dinners, in which I did not participate. However, I felt compelled to give you more of a layman's perspective. The only important people I met there were those with whom I have had primarily an e-mail and/or telephone relationship - many of them for years. I was also fortunate to run into a handful of engineers I have worked with in the past. They all at least feigned being glad to see me again. It was a great experience for both Melanie and me, and well worth the effort involved. Thanks to all! Here are photographs of the booths and, when possible, personnel from all the RF Cafe advertisers who were present. Hopefully, those who could not make it this time will be there next time. If you have a photo of your exhibit booth and would like it added to my collection, please send it via e-mail. Also, if you would like full-size, unedited versions of any of these images, let me know and I will be glad to send them to you. The 2010 IMS show will be in Anaheim, California, and in 2011 will be in Baltimore, Maryland. Most of the photographs below are of RF Cafe advertisers.